Did you guys try the Thanksgiving Leftovers Chili I posted before the holidays? Well, I’m back with another delicious slow cooker meal! I love slow cooker meals year-round because they are easy, require little prep, and allow for less time in the kitchen and more time with family. For the time you do spend in the kitchen, it can become a family affair! I have my kids help me in the kitchen not only so they can know how to cook, but because it also makes dinner prep time quicker. 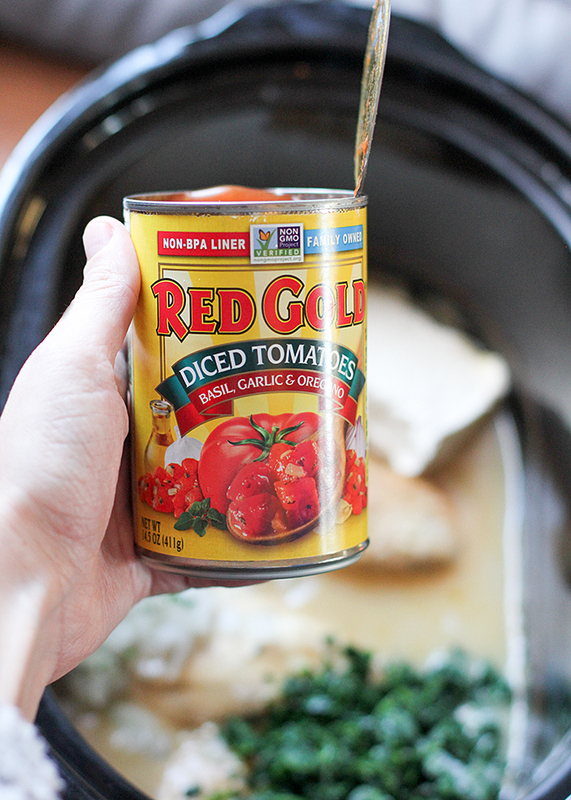 In this Slow Cooker Italian Chicken, I’m using Red Gold diced tomatoes with basil, garlic and oregano. I have been so impressed with the Red Gold brand ever since I visited one of their farms and canning facilities (the fresh tomatoes go from farm to can in as little as four hours!) that I now only buy Red Gold tomato products. My kids and I even did a little challenge (check out the video in my Instagram highlights) where they poured out a can of Red Gold tomatoes beside another brand to see the difference for themselves. With no prompting from me, they described the Red Gold tomatoes as “nice and fresh,” and the other brand “mushed up.” Visit my post about touring the Red Gold farm and canning facility and see why I now use more canned foods! 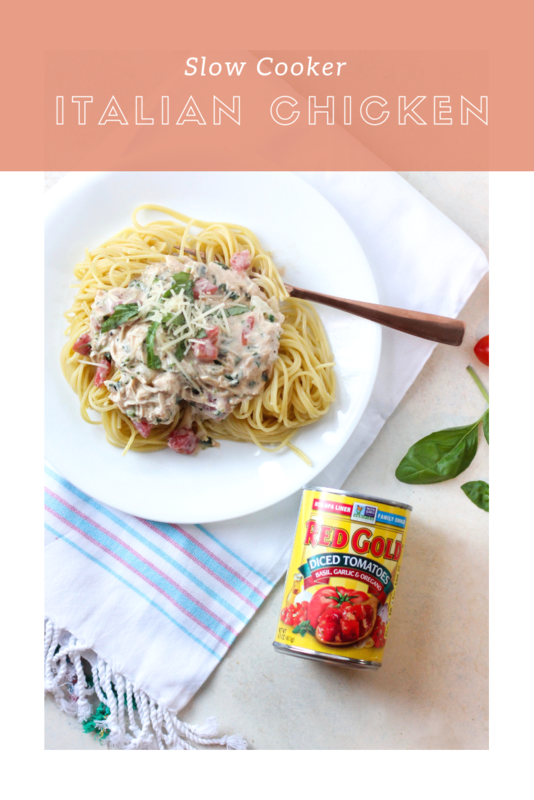 There are quite a few versions of Italian Chicken in the slow cooker that I’ve tried, but this one is the best. I added frozen diced onions and spinach. (I have also added frozen green and red peppers before and that was delicious too!) Why frozen you ask? Canned and frozen foods can be just as nutritious as fresh. They are usually picked and packaged at peak freshness, whereas the fresh lettuce I just bought at the grocery store has a package date of 3 weeks ago! Plus, canned and frozen foods are super convenient (and the extra sodium is a myth!). Not all canned goods have added sodium – check the label! This recipe calls for cream of chicken soup which I used to try to stay away from, but found out you can easily make your own or purchase organic and all-natural cream of chicken in the health food section of your supermarket! This family-friendly recipe will become a favorite! Serve this Italian Chicken over pasta, mashed potatoes or even on a baked potato. I hope you enjoy! 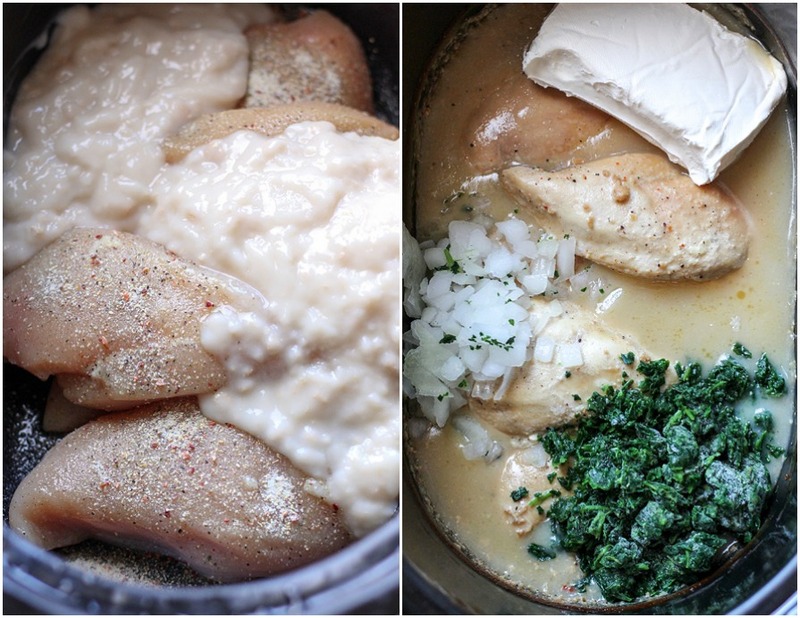 Place chicken in crockpot and top with Italian dressing and cream of chicken soup. After cooking, shred the chicken with two forks. Add the spinach, onion, cream cheese, milk or cream and Red Gold Tomatoes and stir to combine. Continue to cook on high until cream cheese is melted, about 15 minutes. 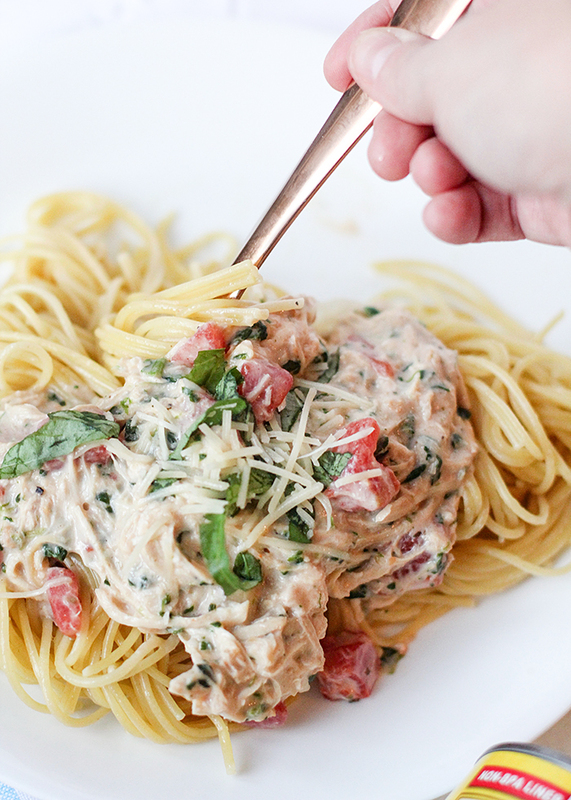 Serve over pasta and top with fresh basil and parmesan cheese. Note: You can make your own cream of chicken soup or there are now organic, all natural soups available at your local grocery store.